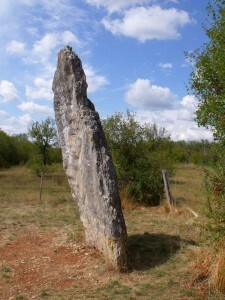 France has thousands and thousands of megaliths and in the summer of 2013 I went with Rich on a roadtrip to visit a couple of areas in the South which are full of different types of site. 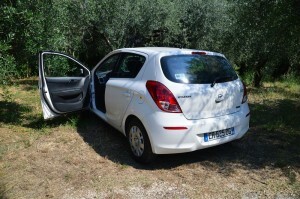 We drove around the regions close to Lodeve (Languedoc-Rousillon) and Figeauc (Lot), sleeping in the car for a week in order to stay within the trip budget of 100 Euros each. 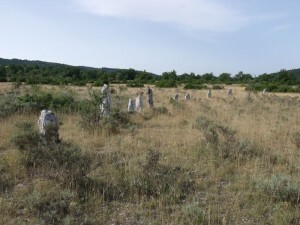 The sites visited were chosen for different reasons but we wanted to show the variety in the sites and to show comparisons with other megaliths around the world. Cazarils Oval Tombs really look like they were for burial purposes and one of them has a stone with an interesting carving on it. 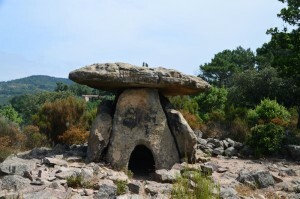 There is also a tiny dolmen with a corridor and within a mound. 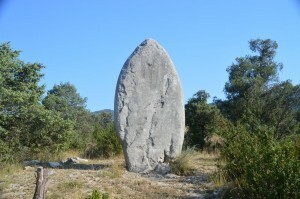 La Pierre Martine with a huge thick capstone measuring 7m x 2m x 50cm and around 10 tonnes. It also seems very flat, looking across the top of it you can imagine doing your ironing on it. 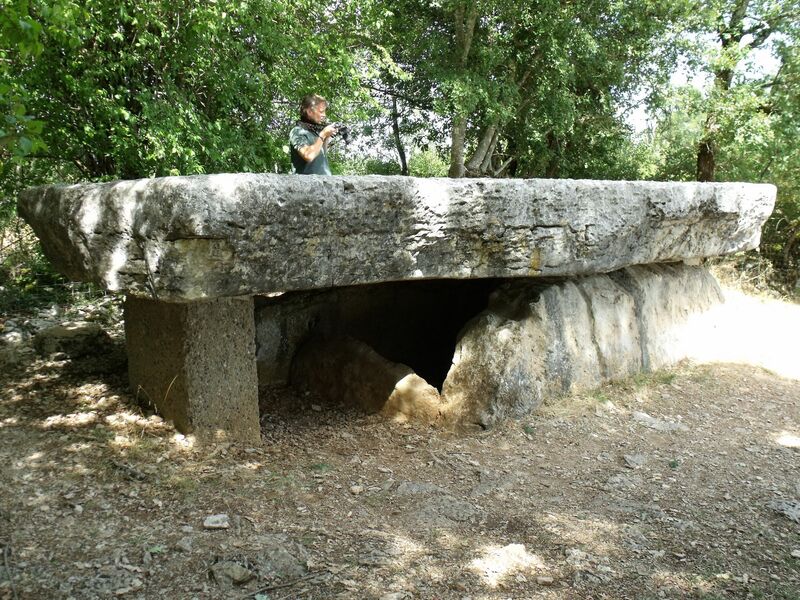 100m from Pierre Martine is Rougié dolmen – about 3m long and also with a capstone broken into two pieces. 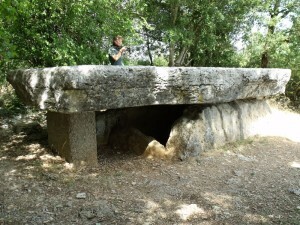 Dolmen de Martignes and Custalou we visited because they were some of the coolest looking in the area close to where Rich was living and Tour-de-Faure dolmen was actually in his village so he chose this as his stone to hug for our ‘Hug a stone campaign’. 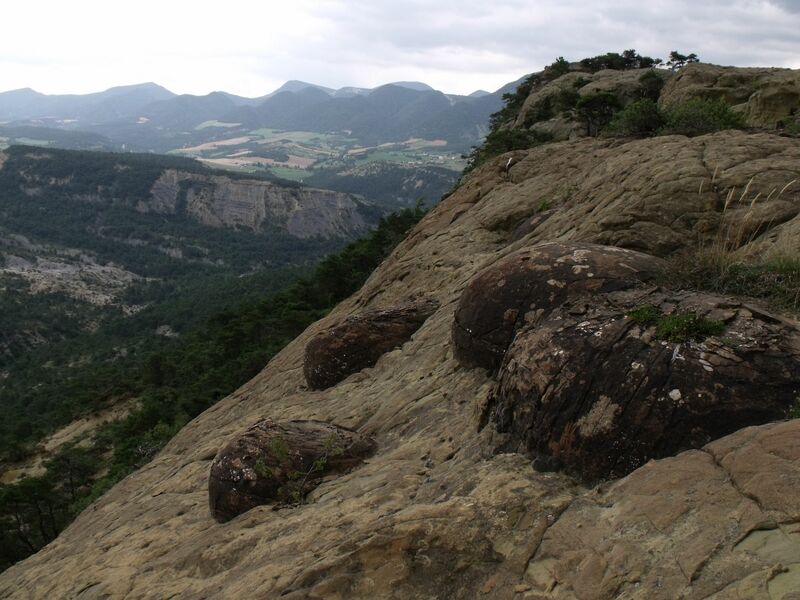 The most famous spheres from around the world are found in Bosnia, Mexico and Costa Rica but on a sandstone plateau above the village of Saint-André-de-Rosans in the Hautes-Alpes region there appears to be several hundred. 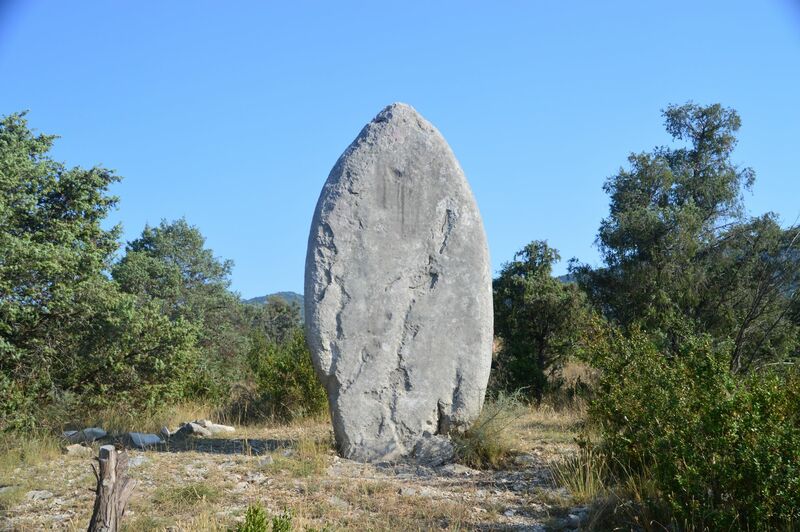 They are far from the regions we had chosen to visit but whilst travelling close to Lodeve we found out about these possible stone spheres and there was no way we were going to miss out on seeing them. It was a beautiful place well worth strolling around. 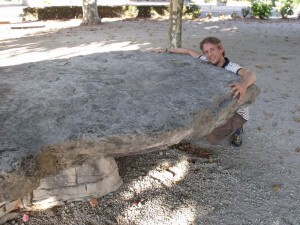 Les Ecuelles du Diable – within the grounds of the St Michel Priory, a few hundred metres from the Coste-Rouge dolmen there are a number of strange shapes carved into the rocks. 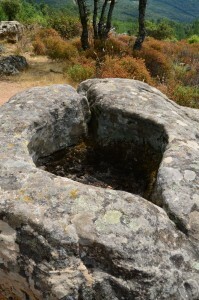 Several rocks have curious basins and channels carved into them, which are thought to have been sacrificial tables with the channels used for the blood to run through. There are stories of sacrifice and some think the shapes were carved to be used as thrones. 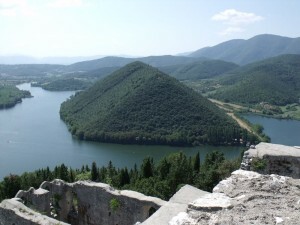 We intended to drive from France to Bosnia to film The Bosnian Valley of the Pyramids but thanks to www.europeanpyramids.eu we discovered that Italy has a host of potential pyramids and we thought we would investigate that instead. 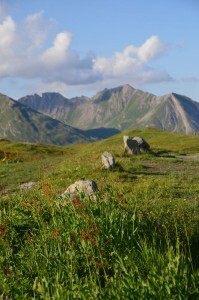 Rich and Mick hired a car to act as their sleeping quarters and transport as they drove over 3500km to take a look at these sites for themselves. 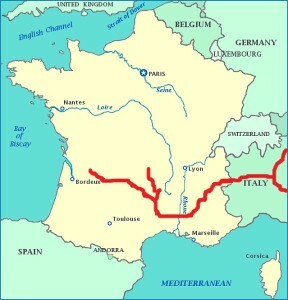 Interestingly they seem to fall along a line running from north to south through the centre of Italy so we wonder whether this connects with the global telluric energy grid. 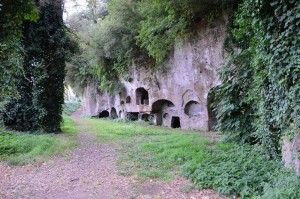 We also visited some Etruscan ruins close to Rome and some fascinating ancient walkways which have been carved out of the rock. 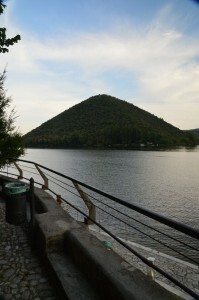 This hill has the most convincing shape of all the hills/pyramids we saw. The faces are orientated in relation to the cardinal points and there have also been stone spheres discovered in the area. 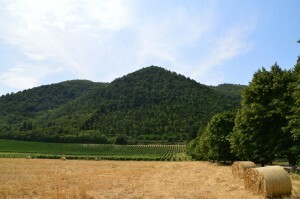 Not far from Florence next to the town of Pontassieve there are 3 hills which are suspiciously shaped. Again they are very convincing from certain angles but less so from other angles, so much so that when we first arrived in the valley we struggled to work out which hills were supposed to be pyramids. 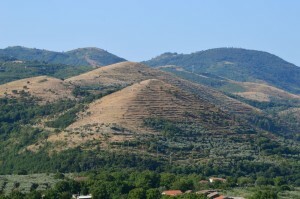 This is because the hills in question appear to be very close to larger hills just behind them almost as if they are attached, again we don’t think this rules them out as being huge ancient structures. There is evidence of settlements in this area 25,000 years ago so it’s possible these were built or modified to be in the shape they are but without excavating we can only speculate. 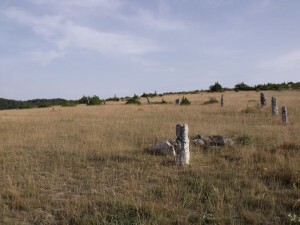 In an area full of megaliths there is a pyramidal shaped stone 5m x 5m x 5m with some alleged cup marks in the shape of the star constellation of Cygnis (Swan) from 13500BC. 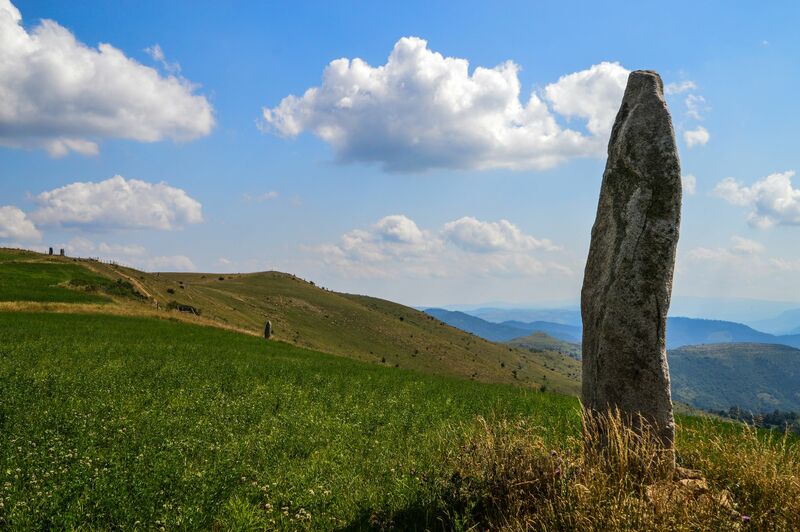 We were passing just north of Roma and we thought we would stop off at some interesting sites potentially built by the megalithic builders. 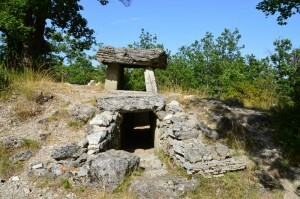 The tombs are allegedly Etruscan but we could see little evidence to suggest they were built by the Etruscans, maybe they used them but why did they necessarily build them. 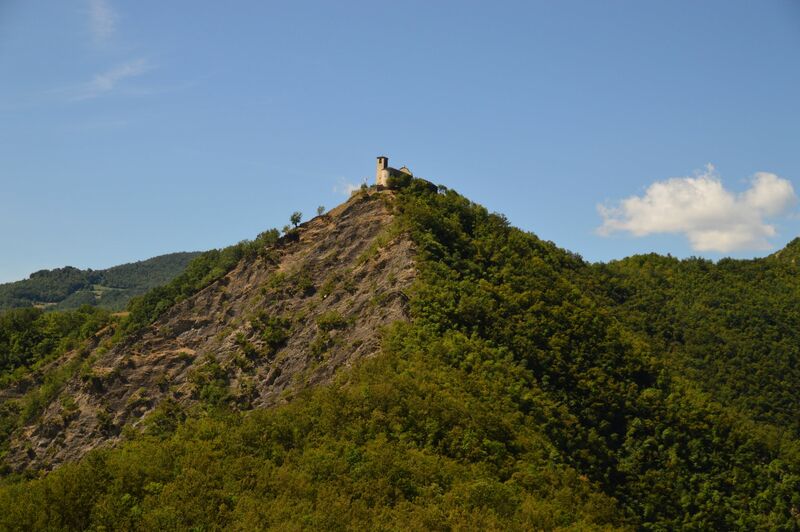 The site has hundreds of tombs which stretch out over a Kilometre towards the town of Orvieto. 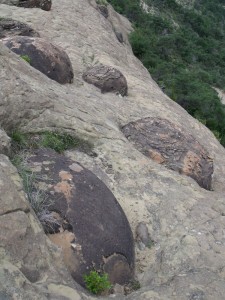 The style of the “tombs” cut out of the rock is similar to things we have seen in other places around the world, such as Turkey and Malta. Not far from the “tombs” there is a network of ancient trackways or narrow roads that are carved into the Tuscan tufa cliffs and stretch on for miles and miles. 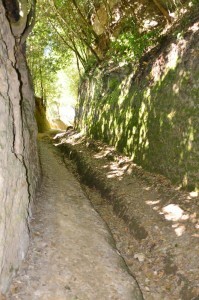 We visited the ones near Sovana which are cut vertically out of solid rock, some 10-12m deep but only as wide as an oxcart, which connect the valley floors to roads on the clifftops. The roadways at the bottom of the slots have been eroded from centuries of abrasion, it’s a fascinating place to hike around and explore.